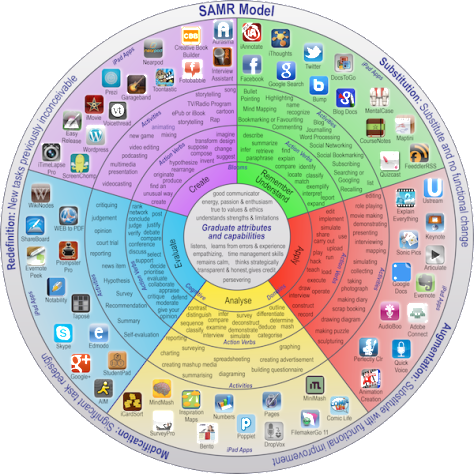 There’s a lot of talk out there about SAMR these days (the model, not the rifle, although both are kind of cool). See what I mean? In well-meaning fashion like Susan, others have pushed the term “life-cycle,” when referring to technology adoption.3 All the while, countless others insist that the only right way is up. We’re all in this together, though, so you tell me: Must our teaching and learning goals always linger in the lofty realms of redefine and create? Is there really no glory in enhancement?4 Or are there legitimately times when it’s OK for students to remember, understand, and apply? I contend that there are. 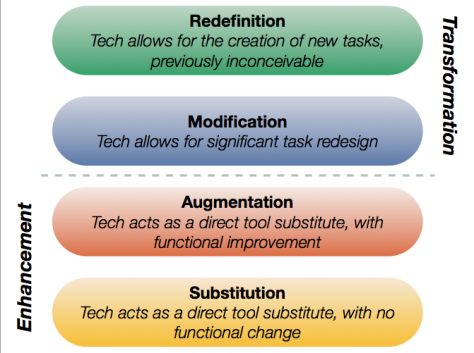 Higher order learning tasks, maybe not; but sensible and important skills, nonetheless. 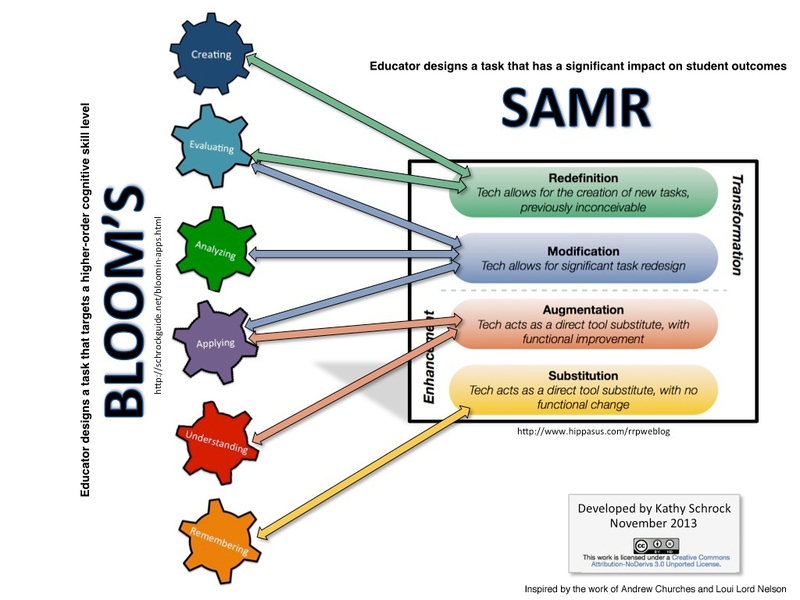 Teaching at higher SAMR levels doesn’t guarantee greater educational benefit. Instead, it more likely results in different educational benefit. But different doesn’t always mean better. So immediately I dug in and quickly learned that Dr. Puentedura had used a study from 1989 to illustrate that when technology allows for the creation of new tasks previously inconceivable (SAMR‘s beloved R), then relatively high effect sizes result (r=1.53, see slide 8 here). Now, I’m a fan of 1989 as much as the next guy, but is this really the best we can do? Why must the creator of one of our field’s most prolific models rely on research older than Netscape Navigator? Our answer may sound a little like this: HYPE. The hype of technology’s bling – combined with well-intentioned pushes for more meaningful experiences of learning – have produced a field ever-eager to jump on the bandwagon. We love a good echo chamber when we find one, but owe it to our students to do better. 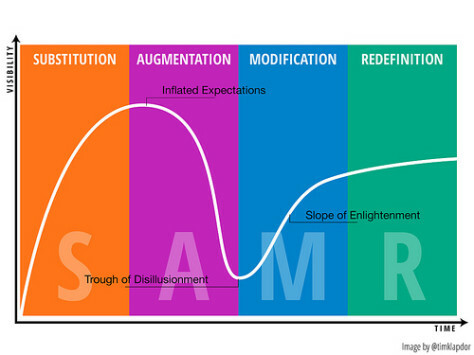 In SAMR-ry,5 I think many of us in education are frustratingly stuck in Gartner’s trough of disillusionment, trying to understand why million dollar purchases are only being used as textbook and bubble sheet alternatives (SAMR’s beloved S!) Here’s to the day when research catches up with vision, and greater enlightenment more fully translates into more meaningful transformation.